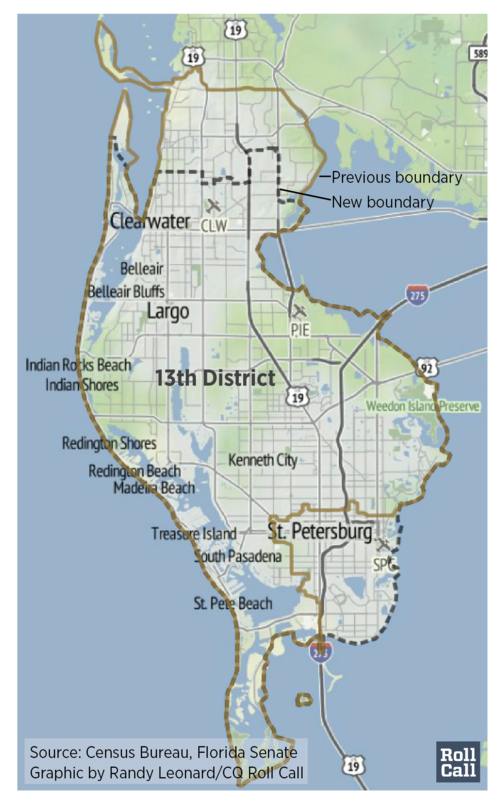 Former St. Petersburg Mayor Rick Baker has declined to run in Florida’s 13th District, closing the book on a Republican scenario to hold the seat. Baker&apos;s decision makes it all but certain that a third GOP-held district will go to Democrats this cycle. We’re changing The Rothenberg & Gonzales Political Repor t /Roll Call rating from Lean Democratic to Safe for Democrats . Also see: The Rothenberg & Gonzales Political Report/Roll Call Race Ratings In Virginia, Democrats are likely to pick up the re-drawn 4th District , where Obama’s 2012 performance was 60 percent (up from 48 percent) under the new lines approved earlier this year. The incumbent, GOP Rep. J. Randy Forbes is running for re-election in the 2nd District, where Republican Scott Rigell is retiring at the end of his term. The seat is also rated Safe for Democrats.